Capstar is indicated to treat infestations caused by fleas. In just 15 - 30 minutes after taking Capstar, you will see its effect on fleas. The maximum efficiency is reached 24 hours after taking. Its use is recommended after 4 weeks of age and in animals with more than 1 kg of weight. 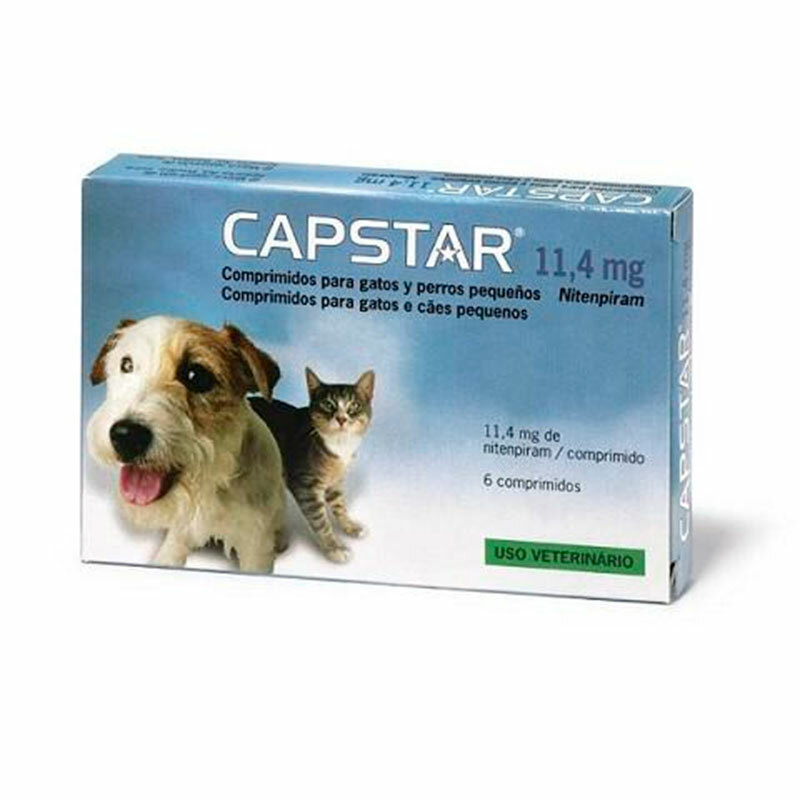 Administer a Capstar 11.4 mg tablet to cats and small dogs weighing 1 to 11kg when a flea infestation is detected. The frequency of treatment depends on the degree of infestation. In the case of a severe infestation, it may be necessary to treat the animals every day or alternate days, until the infestation by fleas is controlled. The treatment can be resumed if the fleas appear. Do not give more than one treatment per day. Capstar has no persistent activity. To prevent re-infestation, an appropriate treatment is recommended to control the immature stages of the flea life cycle. The veterinarian should establish an appropriate treatment. To ensure proper absorption, the tablets should be administered with food, mixed with the daily ration or directly in the mouth after the meal. Fleas will begin to fall from 15 to 30 minutes after their administration. This product eliminates fleas and also prevents them from infecting the pet again. At 6 hours 100% of the fleas will be dead and the medication will remain active (in the dog for 24 hours). Presentation: Capstar 11.45 mg dogs and cats of 1-11kg. 6 tablets per box. A food secure 2050 is a world in which people can afford and access enough healthy, nutritious food. It’s a healthier, more productive, more peaceful world. Of course, the challenge to produce enough nutritious food keeps building as the world keeps growing. In 2012, the world’s population shot past the 7-billion mark on its way to reaching 9 billion by the year 2050.1 It’s not an infinite problem—the rate of population growth will slow significantly by then. But the steepest part of the growth curve is happening now. And in the next seven years, we’ll experience the fastest growth of the global middle class in history. Of course, “middle class” means different things in different places. But, to put it simply, in the next few decades, billions more people will live a better life. And regardless of the specific income figure for a family or a particular country, one thing is consistent: as income grows, one of the first things most people do to improve their diets is by eating more meat, milk and eggs. The United Nations Food and Agriculture Organization (FAO) predicts a 60-percent increase in demand for meat, milk and eggs by 2050.2 Based on today’s production trends, we might not have enough. As hard as farmers are working to sustainably feed a growing world, a gap is beginning to emerge between what we’ll need and what farmers can produce. And, we need to produce more with less. At our current rate of consumption, it takes the Earth 1.5 years to regenerate the renewable resources we use in a single year.3 If we stay on course, by 2030 we’ll require double the planet’s resources to meet our needs.4 And if we don’t start producing more with less, our impact will keep multiplying. Innovation: The tools and techniques that help farmers produce more food more sustainably—innovations that, in many cases, are already available and proven. Choice: For societies, this includes sound, science-based policy choices. Farmers need to be able to choose among tools that help them produce successfully and sustainably, and shoppers need to be able to choose food that fits their cost, taste and nutritional needs. People feeding their families around the world can’t be held hostage by small groups of powerful, ideologically driven consumers. We need the courage to stand up for choice against a highly vocal minority. Trade: The mechanism that allows us to produce food where resources permit and deliver it to people who need it. We believe every person on earth deserves a minimum of a glass of milk and an egg a day. That’s a modest—and achievable—goal, and it’s just enough protein and complete nutrition to make the world healthier and happier. And, frankly, less than that is just not enough. Thank you for visiting with us and taking the time to learn more about Elanco.